More than 100 Omani students participated commemorating their country’s leader Sultan, Qaboos bin Said’s birthday. UNO’s Omani Student Association held a celebration of Omani National Day, Nov. 18, inside UNO’s Milo Bail Student Center. Nearly 250 students and community members enjoyed an evening of great food and entertainment on Thanksgiving eve. According to Ali Al-Ghaithi, a UNO Math major, " More than 100 Omani students participated commemorating their country’s leader Sultan, Qaboos bin Said’s birthday -the day that represents Oman’s glory, pride, and progress. Every year this day is observed with absolute joy and happiness." 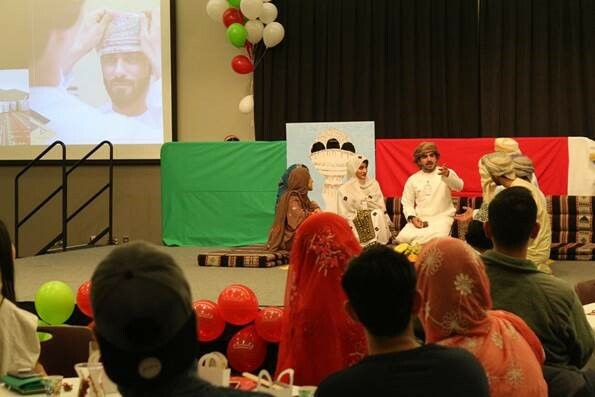 Students sang the Omani national anthem, demonstrated traditional dances, offered an Omani fact quiz show, held a fashion show, and performed a humorous skit about families celebrating the Eid holiday (meals after breaking the fast). Students proudly shared their culture and Halwa, a famous Omani sweet treat. In addition, UNO staff and community members who have traveled to Oman were asked to share their impressions. All expressed an appreciation for the beauty of the country and the great hospitality provided by their Omani hosts. At the end of the performances, the President of the Omani Student Association, Mohammed Al Maqbali, thanked the audience and encouraged everyone to work hard and always strive to do better. 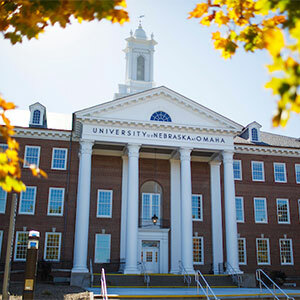 Become a fan of UNO on Facebook and follow UNO's Twitter updates. You can also keep up to date on important UNO News by following the UNO News CenterTwitter account.